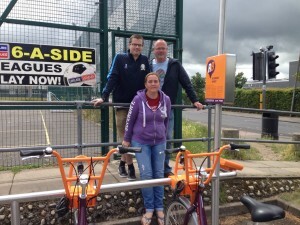 Church ward Councillors at the ReadyBike post in Academy sport. Last month a new cycle hire scheme was launched in Reading called ReadyBike. 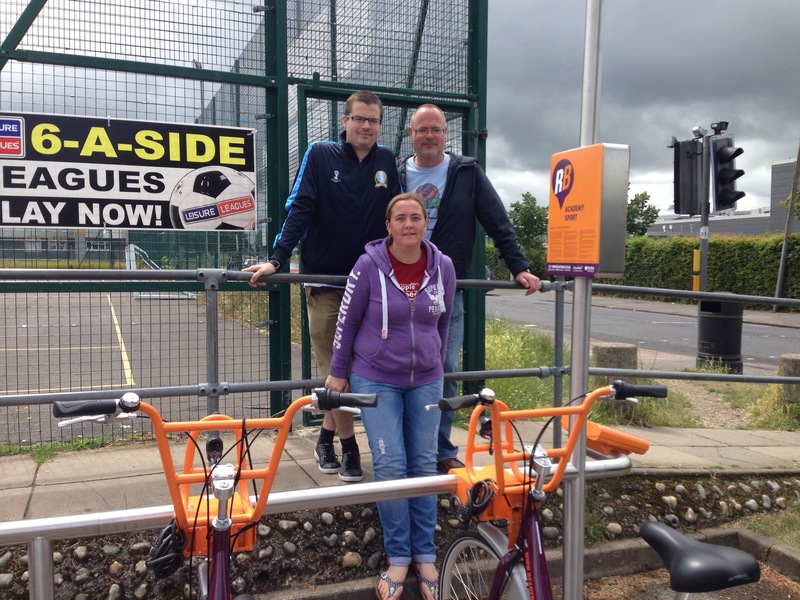 People can now use the distinctive purple and orange bikes located across 27 docking stations in Reading. A 28th and 29th docking station – on the south side of Reading Station and at Earley Station – will be operational later this summer. For members, use of ReadyBike is free for half an hour at the start of every rental and then £1 a hour after that, with a maximum rental cap of £4. As well as the place to register, www.readybike.co.uk is also where members can top-up and manage their accounts – a bit like you do with a ‘pay as you’ go mobile phone account. Annual membership costs £50. For people who do not want to be members, ReadyBike is also available for occasional or one-off use by users registering their details online. The tariff for non-members is the same as that for members (£1 an hour) but they do not get the first 30 minutes of every rental free and the maximum rental charge is £7. Docking stations in Church Ward are located at Christchurch Green by the University and Academy Sport on Northumberland Avenue. Happy cycling! This entry was posted in Ward News on July 10, 2014 by Ashley Pearce.